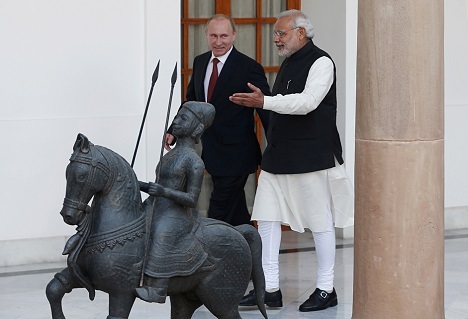 The outcome of the recent summit between Russian President Vladimir Putin and Prime Minister Narendra Modi in New Delhi gave an all-embracing boost to the strategic partnership between Russia and India. A total of 20 agreements, including in the key fields of defence, nuclear energy and oil and gas were signed during the summit. All these deals are long-term in nature. According to the media reports, during the summit, the two sides signed $100 billion worth of commercial deals, including $40 billion in nuclear energy, $50 billion in oil and gas and $10 billion in the fields of defence, fertilizers, space and diamonds. A Joint Statement for strengthening the Indo-Russian friendship over the next decade was also signed. While the unprecedented success achieved by the two sides during the summit was welcomed by Putin and Modi, at their joint press conference, it provoked US to issue angry statements, disapproving the further strengthening of Russia-India bilateral ties. It was not only upset over India’s move to sign a slew of agreements with Russia, but also strongly objected to the presence of Crimea’s Prime Minister Sergei Aksenov in Putin’s delegation. It may be recalled, Aksenov had been included in the list of sanctions of the US, EU and Canada. Washington took the Indian move, as a challenge to its so-called “global authority” at a time when it was coercing the European Union (EU) and other countries into tightening a series of sanctions against Moscow following the Ukrainian crisis and reunification of Crimea Republic with Russia in a referendum earlier this year. Pro-West Ukrainian President Petro Poroshenko, who was on a visit to Sydney, also did not lose time to condemn the Indian move to welcome Aksenov in India. With their eyes on defence and nuclear energy deals, the US and other Western leaders have been trying to woo the new Indian Prime Minister for closer cooperation in these fields. Washington wanted to capture India’s defence and nuclear energy market. It recently dislodged Russia from top position in supplying arms, but so far failed to get any nuclear reactors deals. During their talks, in New Delhi, Putin and Modi decided to speed up the implementation of defence and nuclear energy cooperation programmes between the two countries. The US fears that their decision to increase bilateral cooperation in these spheres may make it lose the Indian market to Russia. Reacting over the Indo-Russian deals in defence and nuclear energy fields and inclusion of Aksenov in Putin’s delegation to India, in Washington, the US Department spokeswoman Jen Psaki said: “It’s not time for business as usual with Russia. We have conveyed this, certainly, to our allies and to our partners across the world.” She also said that the US was “troubled” by reports that the delegation accompanying Putin included Aksenov and sought clarifications on the matter from New Delhi. Since the beginning of the Ukrainian crisis, India has refused to back sanctions against Russia by the West. On the eve of the India-Russia summit, the External Affairs Ministry in a statement reiterated that New Delhi could never be a party to any sanctions against Moscow. The Joint Secretary (Eurasia) in the Ministry, Ajay Bisaria said the Indo-Russian ties are characterized by “special and privileged strategic partnership” and India considered the Ukrainian crisis as the former Soviet Republic’s internal problem. In this connection, the trip by Aksenov to India could negatively affect “the friendly relations” established recently by Modi with US President Barack Obama during his visit to Washington, in September. Modi has already invited Obama to be the chief guest on the India’s Republic Day on January 26. Analysts said the controversy could overshadow Obama’s visit. During his visit to Mumbai, Aksenov signed a MoU between Crimean Republic and Gul Kripalani, chairman of the Indian business group Indian-Crimean Partnership. After signing the document, he said that the MoU is an “important milestone” in the development of bilateral relations between Russia and India. Aksenov organized a paramilitary force on the Crimean Peninsula early this year as pro-Western protests grew in Kiev, the Ukrainian capital. He was one of the first people to be singled out by the United States for sanctions. The symbolic show of support has put New Delhi in the middle of one of the bitterest disputes between Moscow and the West. After his return, Aksenov told reporters in Simferopol that US State Department’s spokeswoman’s statements against his trip to India, “have not brought any results” to the US representative. “During the trip, this country’s leadership achieved the objectives it had. With the Indians, we discussed various business topics and we share an understanding on how to proceed with the implementation of projects. For further cooperation, we have invited to Crimea representatives of India’s businesses,” he said. Russian State Duma, the lower house, International Affairs Committee chairman Alexei Pushkov said the US call on other countries not to have dealings with Russia was absurd. "The US has called on all countries of the world not to conduct business with Russia. I think this call won't be heard outside the US’ close allies. It is absurd," Pushkov said. The Indian External Affairs Ministry has so far not officially commented on the attack from the US and Ukraine over the issue. Observers said it’s too early to forecast how India might react to the pressure from the US regarding its bilateral relationship with Russia.